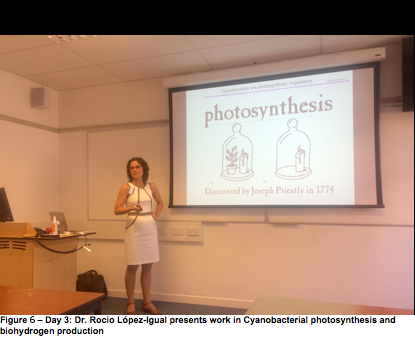 Summer School in the University of Warwick co-organized by PLASWIRES and EVOPROG consortia from FET Proactive: Evolving Living Technologies. 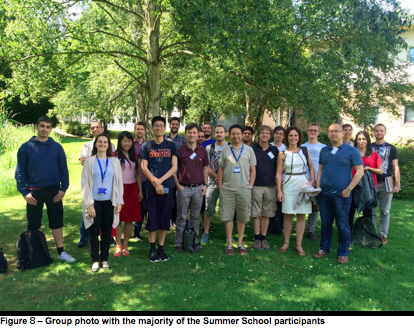 The Summer School took place at the University of Warwick and was co-organized by the EVOPROG and PLASWIRES consortia from FET Proactive: Evolving Living Technologies. 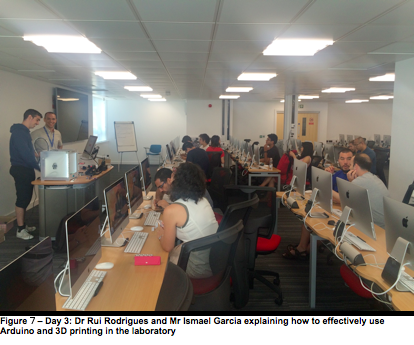 During the 1st-3rd of July 2015 the participants attended a set of lectures and tutorials aimed at increasing their knowledge on modelling, genetic circuits and customised labware for Synthetic Biology and Directed Evolution experiments. 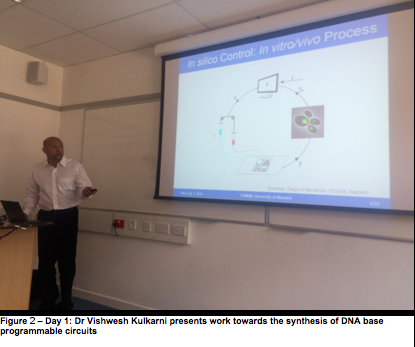 The aim of this Summer School was to deliver a set of lectures and tutorials that will endow the participants with sufficient knowledge to develop experimental designs integrating modelling, genetic circuits and customised labware for Synthetic Biology and Directed Evolution. A wide range of backgrounds was present, including synthetic and systems biology, computer science, biomedical and electrical engineering and physics. The make up of talks and tutorials reflected this diversity and promoted active participation of all attendees. The Summer School presented to the wider community the partners, developments and vision of the EVOPROG and PLASWIRES consortia, with the prospect of generating an open discussion and develop collaborations on the core subjects presented. The scientific programme focused on the skills existing within the EVOPROG and PLASWIRES consortia and included some speakers from the University of Warwick. "Simulating multicellular genetic circuits with an individual-based model: new features in GRO simulator." "Computational modeling of multicellular bacterial populations"
"New tools for gene evolution in vivo"
"RNA technologies to engineer gene circuits in bacteria"
"Engineering synthetic patterns inspired by development"
"Phage production and analysis of the titer"
"Designing Portable Gene Expression for Cross-species Application"
"Creation of reproducible custom components for the lab"
A Summer School with the objective of increasing cooperation and expertise exchange between FET projects EVOPROG and PLASWIRES was organized and held at the University of Warwick from the 1st to the 3rd of July 2015. 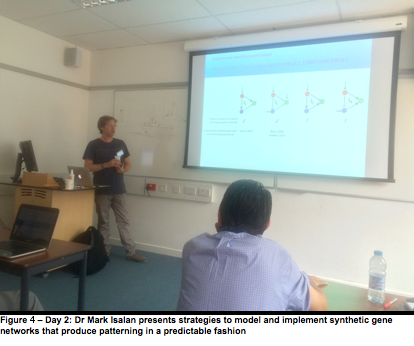 The Summer School on Integrated Technologies for Synthetic Biology and Directed Evolution and was attended by 32 participants of different backgrounds (mathematics, biology, bioengineering, synthetic biology and physics), including students attending different programs at the University of Warwick. The school covered a range of topics of broad interest relating to modern world such as energy, novel biologicals for healthcare and biotechnology or emerging innovative technologies for life sciences and bioengineering. Tutors and lecturers shared theirs expertise in protein engineering, 3D printing, microbiology, synthetic biology, directed evolution, and genome engineering. Each day was divided into morning and afternoon sessions. The morning sessions involved talks on applications of riboregulators for synthetic biology, engineering programmable genetic circuits to control gene expression, exploitation of cyanobacteria for practical applications, strategies for controlling gene diversification for directed evolution, and advancements in genome engineering. The afternoon sessions were laboratory-based activities and provided opportunity for gaining hands-on experience in operations on bacterial cells, modelling in 2D and 3D spaces, phage production and titration as an introduction for phage assisted continuous evolution and also robust phage display for antibody development, 3D printing and integration of 3D objects with sensors and sensing/control using Arduino boards. The participants gained transferable sets of skills valuable for both academia and industry, which will be beneficial for their future careers. The techniques taught are particularly relevant for those looking for future employment in facilities operating with bacterial cultures (fermentation), phages (evolution of biomolecules, antibody engineering), 3D designing and printing (hardware engineering), or industrial setups operating on modified organisms for commercial bioproduct formation. Each day was concluded with a social event held within the University, which extended the opportunities for professional networking, exchange of ideas and establishing future interdisciplinary collaborations.